Ok - hate is a strong word, but I really do not like running on treadmills. Spring Break started on Friday and I decided to take my son to Myrtle Beach for a little vacation. Before we left, I ran a seven mile run with my Palmetto200 team. We ran at a pretty fast pace for a long run, but it was only seven miles out to Sullivan's Island and back (9:40, 8:55, 8:41, 8:41, 8:31, 8:25, 8:22). Hitting negative splits was a nice bonus. I was supposed to run another three miles that night, but I was on vacation and I was not going to make my family change plans for three miles. My wife had to head back to Charleston on Sunday (she has to work this week - not me!!!). 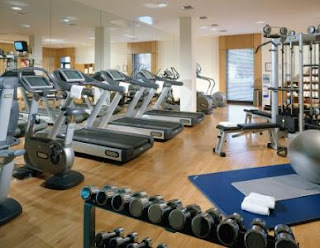 I did not think it would be very responsible of me to leave my six year old son in the hotel room while I ran, so we went down to the workout room. I got on the treadmill and I set my son up on a step/run machine (I have no idea what it was, but he really liked it). I ran 3.5 miles (8:00 pace). I only ran that fast because it was so crazy boring! Peyton ran two miles and we called it a day. Monday, we got up early and went back to the workout room. I ran 3.5 miles (8:00 pace) and Peyton ran 1.5 miles. We got out of there as fast as we could and headed out for some fun in Myrtle Beach. Tuesday, we were back at the workout room for our last day workout. I ran 3.0 mile (7:45 pace) and Peyton ran 1.5 miles again. I ran as long as I could stand it. I have no idea how people run in place for so long. I was bored out of my head. After we finished, we rinsed off and jumped in the pool and had a blast. Don't forget to sign up for the Feetures! Socks giveaway! I love the treadmill. I know, I'm in the minority but I do. What can I say? One of the things I like about it is that it helps me grind out miles. I usually get in at least one five-mile run a week at the gym, so when I crank out mile after mile on the treadmill, it doesn't seem as tough doing so outdoors. Of course, I would prefer to run outdoors but that's not always the case since I usually have my four-year-old daughter with me. Once she starts school later this year, things will change but running 5-7 miles on the treadmill doesn't even faze me one bit. I definitely see the benefit of a treadmill when you need to crunch miles, for sure. I remember running on treadmills on ships when I was in the Navy. It was the only way to run at all. Now though, I don't think I could do it. I'm with you, Noah. Hate 'em.